OhMyVera! 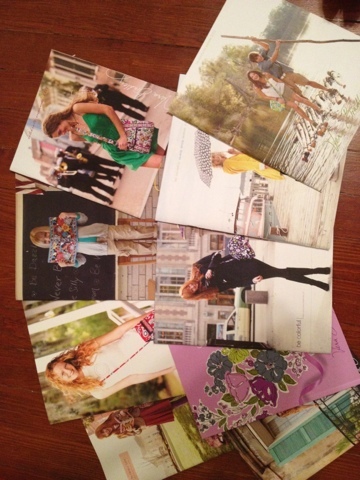 A blog about all things Vera Bradley: Too Many Catalogs! This week I am packing so that I can move into a new place next week. Last time moved I had to toss a bunch of Vera Bradley shopping bags, this time I think I am going to toss all these catalogs! I can't keep moving them around! Oh, I know. I can't get rid of mine, either, though I know I really should at some point. You should give them away. Sometimes I see them for sale on eBay, seriously! I agree with Annie! They'll sell on eBay! I've always "sort of liked" VB bags (have a couple of totes in Daisy Daisy bought for a trip a few years ago) but never got into the purses. Then, I saw Deco Daisy and, OMG, was I hooked! Anyway, love love love the blog and felt compelled to write a comment because I'm in the DC area too. Lucky me, I am about 20 minutes from the Leesburg Outlets. How do you get catalogs? Can you subscribe? Or are they like in house at the stores? I'm still jonesing for a store out here in Vegas. I've lodged a complaint/request on the VB facebook page, but I feel like they shrug it off because we have private boutiques that sell pieces. But man, is it not the same. I wish I knew whose ear to really try to get about it. You have to sign up to receive catalogs. I dont know if it can be done online, so I would contact customer service. I signed up at a Vera Bradley store.